I am currently working on a gameplay mockup. The game's working title is "Nordwand", and it is gonna be about climbing in the mountains, approx. 100 years ago. The next step for me was to show a typical gameplay situation. I've been struggling a bit with the rock texture. I want to use a tiling texture for the rock because of technical / production related reasons (if the game is ever going to be made). I'm pretty happy with the clouds, but unsure about the distant mountains - however I really do not want to put too much detail into them to not distract from the most important foreground. The game is most likely gonna be played in 2x the resolution. This game sounds like fun. Looking good as well. Those latest rock textures look good but to me they don't really fit the face of a cliff on a mountain, they look rather porous like Igneous rocks from a volcano rather than smooth granite from a mountain. gah. for some reason my pictures turned out to be .jpg after uploading. Yes, as I said, I have been struggling with the texture of the rock wall. 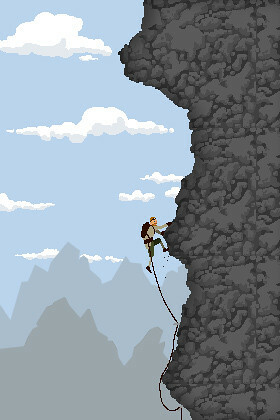 I have never really done a pixeltexture of a rockwall before, and all the reference I found was not really fitting. I'll see if I give it another shot. Even thoug I did not want to focus on it for now I played around some more with the rock texture. For the first time ever I used a picture of a very nice rock surface and sent it through photoshop to get a rough impression if the general look would fit better. Since I kind of like the look much better now I guess I'll recreate this one, in a much "cleaner" style (and with less obvious tiling) so it fits to the scene and "my" style. This single scene has such potential. I can imagine the way the controls would work, the way the ropes would have physics and if you didnt peg into the mountain often enough, you'd have a nasty fall which would potentially rip out more pegs.. etc. The mountains in the background are perfect, just enough detail there. What I'd suggest with the rock face is to have the obvious tiling texture as you have it now, and then have single pieces of rock or outcropping scattered on top of the base rock texture. These would be layered together in the game so that you can have infinite rock walls, with randomly placed sprites on top which break the tiling. Thanks, I also have high hopes for the concept. I'll talk / link to the actual gameplay ideas once I have settled them with the other people involved in this. Generally speaking the game will be very simple in its core, with the basic theme of finding your "inner rhythem". Layered on top of that will be randomized level generation and (hopfully) a pixel art 2D physics ragdoll (and yes, the rope will also be dynamic). You are so right about the rock texture. That is exactly what I have in mind with it. I could even go a bit larger with the tile (currently it is 128) since texture space will not be a big issue. And yes, on top of that we'll have several things - "darkness" bleeding in from the rim of the left (as you can already see in a basic form) and then multiple "noise" layers on top with little grass stuff and similar things. In addition, I'll come up with various variations of this rock texture, like sandstone, snow-covered, etc. to serve as different level themes. 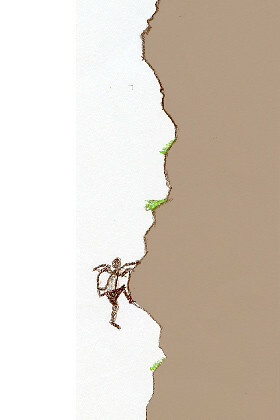 I'm interested - from a technical point of view - how you're going to generate the cliff edge? Some sort of fractal noise algorithm would be needed to give the necessary smaller details, but it almost looks like the rock tile is following the contour of the cliff edge, which would have been done by hand. Are you just straight blending the rock texture with a dark edge to give that effect? It should not be too difficult to detect the dark areas of the texture and let the cliff edge "bleed" into those.